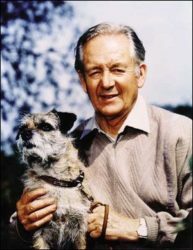 Welcome to JamesHerriot.org, a wonderful site for fans of James Herriot. Although this site has been around for years, a little more interactive action was needed. So look around, read some stuff and leave a comment! I once listened to an audio tape of some James Herriot stories, read by the author. His voice and accent were amazing and I would love to locate copies of those again. Does anyone know anything about them? Everything I can find now is read by Christopher Timothy, who is very nice, but not what I remember. The only one I have ever been able to find is James Herriot Reads from His Books If Only They Could Talk and It Shouldn’t Happen to a Vet which is sometimes on Amazon, as well as eBay. As far as I know, I don’t think he ever read any others. Good luck!